The aim of this exploratory study was to examine patient satisfaction and outcomes from exposure with response prevention (ERP) delivered in a group therapy format. The group was aimed at addressing eating disorder symptoms associated with body dissatisfaction in the later stages of outpatient treatment. 33 adults with a DSM-5 diagnosis of an eating disorder participated in the ERP group. Participants completed pre- and post-ERP group measures of depression, anxiety, self-evaluation based on body image, restraint, eating concern, weight concern, shape concern, upward and downward appearance comparisons, and patient satisfaction. Involvement in the ERP group was associated with significant decreases in self-evaluation based on body image, restraint, eating concern, weight concern, shape concern, and upward physical appearance comparisons post-group treatment. This adjunct treatment group was well received and viewed as being helpful by participants. 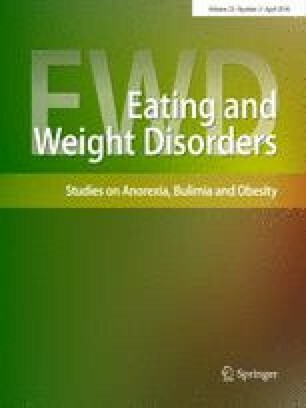 ERP in a group therapy format for addressing body dissatisfaction may represent a complimentary approach to current evidence-based treatments for an eating disorder, and warrant further investigation. We would like to thank all members of the AEDP, and the patients who consented to take part in the clinics program evaluation research as part of their care. Special thanks to Cathy O’Brien, social worker who was a group facilitator, Dr. Pallavi Nadkarni, attending psychiatrist, as well as the clinical psychology practicum students and psychiatry residents from Queens University who helped co-facilitate the group. The authors have none to disclose. Informed consent was obtained and all participants provided written consent to participate. This study met ethical compliance and clearance through the Queens University Health Sciences and Affiliated Teaching Hospitals Research Ethics Board as part of the clinics ongoing program evaluation research.